Soprano Barbara Bonney dedicates this evening to lieder by Mozart, Previn and Strauss in a programme that extends from the classical period to the present day. On this new release from Belvedere, which is a recording from Mozartwoche 2000, Barbary Bonney interprets 'Sallie Chisum remembers Billy the Kid' - which was written for her. 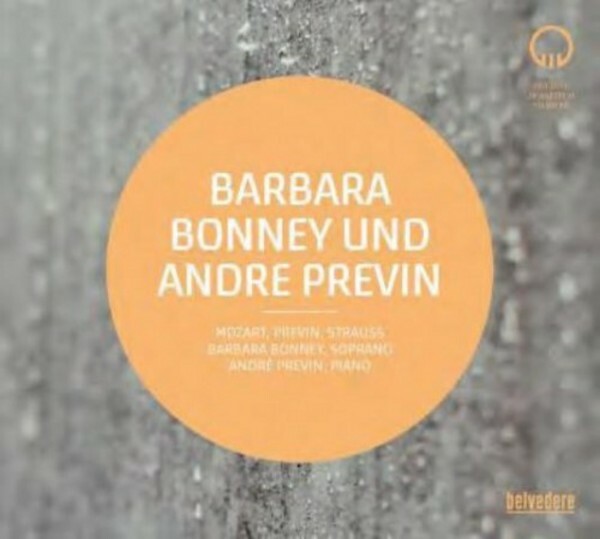 In Bonney�s work with Andr� Previn the American art song has become more and more important. In the third part of the Concert she sings Lieder written by Richard Strauss and shows again her attention to detail and her interest in the meaning of the lyrics. Desire is the theme that weaves in various aspects through all three parts of the concert: in Mozart it is the search for his dream, the longing for spring, the desire to be loved. His 'Kleine deutsche Kantate' KV 619 can be heard as an appeal for tolerance and unity. Pr�vin bases his compositions on contemporary American poetry and with them touches on the wish for recognition as well as for the abolition of inequality between people. Strauss, on the other hand, expresses in his unique colours the search for peace of mind in nature and in a love that is beyond this world. Barbara Bonney, Andr� Previn and Franz Bartolomey convey all these messages with a fine yet robust artistry. Sheer enjoyment from Salzburg.